The ultimate guide to Breckenridge ski holidays. Up in the Tenmile Mountain range in Colorado, Breck prides itself in offering one of the best snow-sports experiences in the world. Providing a genuine American experience, this resort delivers a huge, varied ski area with high average snowfall, exquisite dining options and superb nightlife, as well as a variety of non-ski activities for those not sold on the adrenaline kick of the slopes. With the ski resort opening in 1960 after fears of the community becoming a ghost town, the popularity boomed from an astonishing 17,000 visits in its 1st season to 221,000 visits 10 years later. Nowadays, an astounding 42,880 people can be uploaded on the lift system every hour. As a large town, 7 miles long and 2 miles wide, the offerings of shops, restaurants and amenities can keep anyone busy. 104 miles from Denver International Airport, the transfer here tends to take around two hours. You can also fly to Eagle County Airport from most American city airports. At only 60 miles east, this reduces the transfer time to an hour and a half. On arrival, you may recognise the resort from films like Dumb and Dumber and National Lampoon’s Christmas Vacation. An ex mining town, founded in 1860 during the gold rush, it’s steeped in history which translates to activities offered throughout, such as goldmine tours, horse and carriage rides and museum visits. If the town isn’t enough to draw you in, the exceptional skiing certainly will. Settled within a short distance of a number of other top quality resorts, the ski area is colossal, enough to stay entertained for a whole season, let alone a week. There’s no reason to ski the same slope twice with the appropriately named Epic 7 day Pass. This allows for not only skiing in Breckenridge, but other mountain legends: Vail, Keystone and Beaver Creek, Northstar, Mt. Brighton, Heavenly, Kirkwood, Afton Alps, Canyons and Arapahoe Basin. Famous for its freestyle, Breck was the first resort in Colorado to actively support snowboarders and provided the world’s first freestyle snowboard event in 1985. Continuing this custom, it has since hosted the Dew Tour and the Supergirl all-female slopestyle competition. Naturally, this translates into the public parks and here you’ll find 4 parks of the highest quality for varying abilities, as well as two pipes. View our detailed Breckenridge snow forecast or snow report and see all live webcams, piste maps, road and travel maps and lift pass prices. For a picture of historic snow conditions see the snow depths month by month with our Breckenridge snow history. Night Skiing: No but is available in Keystone a short drive away – can use daily Breckenridge pass. Breck prides itself in its diverse, challenging-to-all ski area. At a huge 2,908 acres, with 187 runs, the possibilities are endless with off piste, 4 freestyle parks, two half pipes and high tree density providing numerous tree runs lower down the mountain. Novices should take advantage of the excellent ski school; set up by the 1955 Norwegian Ski Champion Trygve Berge, the Breckenridge Ski School now employs over 600 instructors, providing numerous lesson options for beginners through to experts. Complete beginners will be comfortable on the carpets available at the bottom of Peak 8, and those with a little more confidence can find more advanced beginner runs in the slow zones at the bottom of Peak 8 and 9. Lower 4 O’clock is a definite recommendation; a green completely in the slow zones, this is part of the longest run in the resort and can be accessed by Chair 5. Intermediates also have heaps of choice; Peak 7 and 9 have a huge assortment of blues of varying difficulties. Sticking to the lower slopes will keep the gradient down with runs snaking through trees. However, if you’re looking for more of a challenge, the higher you go, generally the steeper the slope. A particular favourite is Claimjumper, offering beautiful views from fun rollers, which can be accessed by Independence Superchair. Experts will be in heaven on the more demanding slopes. After a large snowfall, the natural, unpisted runs can grant the biggest challenge, from trees to steeps to bowls. Usually, the higher you go, the more difficult the run, with Peak 8 and 10 offering the biggest range of expert runs. If you really fancy your chances, 9 Lives is a crazy option, having a slope gradient of over 50 degrees at its steepest. Warning: not for the faint hearted. With its intricate history in the promotion of snowboarding and freestyle, it’s easy to see why Breck has become a mecca for freestyle. The four parks here cater for every level; the Bonanza contains small features for those testing the waters, whilst the Freeway hosts four huge kickers and a 22 foot Superpipe. If you’re lucky, you can watch the pro’s that often frequent it. The quality of the parks has not gone unnoticed, and has been recognised by numerous awards, notably Best Park by Freeskier Magazine in 2011 and 3rd out of 30 resorts for Best Park by Ski Magazine in 2012. Although the town’s popularity and size exploded due to the founding of the ski infrastructure, the fact that this isn’t a purpose built resort but an already established town offers a richer depth of activities and après than many other resorts. European après style is not overlooked and can be found in abundance here - head to T Bar, next to the BreckConnect Gondola, for the highlight of the après scene - open til 6 with easy downloading for those choosing not to ski down. Once in town head to Angel’s Hollow for their famous margaritas and sun drenched patio, or Burke and Riley’s Irish Pub for some fantastic views and great selection of draught beer. If you don’t fancy finishing here, there are a number of clubs in town to cater for hard-core souls. Cecilia’s Martini Bar is one of the premier clubs offering many bars on numerous floors, and even a cigar room. With 76 restaurants and bars to choose from, you’ll be spoilt for choice. If you’re looking for an upmarket bistro, try Blue River, which does amazing French, Italian and American food. South Ridge Seafood Grill is a cheaper option, with a menu split between “Things that swim” and “Things that don’t”. For something a bit different, head to The O2 Lounge on South Main Street. Here you can get hooked up to machines that let you breathe air with up to 90% oxygen – perfect if you’ve got a bit of a hangover, are suffering from the altitude or just to feel re-energised! It’s also a great place to grab a coffee and get on the internet. You’ll get a real feel of Breck being an established town throughout your stay. 18 museums and art galleries display the history and culture of the area, with the Victorian architecture making it much more pleasing to the eye than most other resorts. Book a horse and carriage ride, or simply wander around the 203 shops during some retail therapy. Other amenities and activities include a golf course, tennis courts as well as year round ice skating. When is the best time to ski Breckenridge? With the town sitting really high up at nearly 3000m above sea level and the average snowfall well over 300 inches a year, it’s no wonder that skiers come from all around throughout the season. The 2,908 acres of skiable terrain houses 187 runs, and with about 600 acres groomed daily, the diversity on offer is overwhelming. Breck’s lofty height keeps temperatures down and retains the snow throughout the season, with the lifts usually opening at the beginning of November (in European resorts they tend to open a month later) and closing around mid-April. For the most powder, visit between January and March as this time of year sees the heaviest snow fall. If you prefer milder conditions, ski here in the spring, as the snow usually stays amazing, there’s less wind and you’ll also get a lovely dose of sunshine. We love the buzz of the resort during peak weeks, but if it’s a quieter town and empty slopes you want, see if you can book outside Christmas and New Year. Having such a friendly atmosphere is just one of the things that makes Breck such a perfect resort for families. Our range of accommodation caters for all ages; the child friendly chalets and hotels often have the option of being catered, meaning you won’t have to touch an oven during the week providing the all-important rest that a holiday should provide. Some hotels also offer childcare services for those too young or not too keen on skiing – you can see which by looking at their individual pages. If your accommodation does not have these facilities, additional childcare can usually be found elsewhere in the resort – Breckenridge Child care has the convenience of three centres at different locations in the resort, and will care for your child from the age of 2 months to 5, freeing you to enjoy the more adult things that Breck has to offer. Alternatively, you can use a babysitting service, such as Resort Sitters, meaning you can go and catch a lovely dinner or hit a few bars child free. Apartments can also be a great option, offering either budget or luxury accommodation. These can allow for eating in if and when preferred, or dining out in one of various family friendly restaurants – we love Southridge Seafood Grill, which has a great, very reasonably priced kids menu. 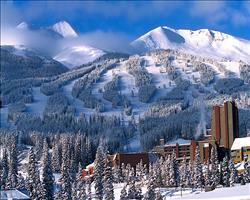 Breckenridge is also well known for its top quality ski school. With over 50 years of experience and over 600 instructors, they offer lessons from complete novices to experts in groups or 1:1. Whichever you choose, you can be sure that your child is in safe hands whilst you ski wherever you want or sample one of the many bars in town. The variety of green and blue runs on Peak 8 and 9 are perfect for children with a bit of confidence, as well as the Bonanza Park offering small jumps for those that are more daring. For those who don’t fancy the skiing, there are usually family friendly events throughout the season, especially at peak times such as Christmas, New Year and Easter. Even outside these times, you’ll find loads of activities to keep the whole family entertained, such as tubing and tobogganing in Keystone, swimming or dogsledding. Breck has long been a favourite among groups, as the sheer scale of the resort offers variety both on and off the mountain. If you’re looking for a more traditional holiday with a more intimate setting, why not try a chalet. With the possibility of filling the whole chalet as a group, you’ll have a more private setting – most chalets are catered which can solve the awkward problems of trying to find a restaurant or cook a meal that keeps everyone happy. We love Chalet Victoria, which sleeps up to 8 and is close to loads of shops, bars and restaurants. If you’re part of a larger group, a hotel may be a better option. We have an assortment of hotels catering for a range of budgets - larger hotels like ski in / ski out Beaver Run Resort are much more likely to be able to accommodate bigger groups. These larger hotels usually have additional services and amenities on site, like bars, cafes and pool, perfect for regrouping and chilling out at the end of the day. In addition to the two prior types of accommodation, condos are a great way for groups to holiday. There are a number of benefits of this accommodation, the first being the self-catered nature – this avoids the awkwardness of always looking for large number of seats in restaurants and means groups can cater for varied tastes. In addition, this can keep costs down, satisfying most budgets. Lastly, condos often have more beds per property than hotel rooms do, such as the Pine Ridge Condos which can sleep up to 8, which is more likely to keep the group closer together than in a hotel. The surrounding area offers varied terrain for all levels of skier and boarder, with the ski school’s 600 instructors covering all abilities, making sure everyone in the group is provided for. For a group with differing ability levels, head to Peak 8 for a diverse choice of green, blue, black diamond and double diamond. An all important factor for most groups is the social side, and with Breck’s 76 bars and restaurants, a range of tastes is more than covered. Whether its live music you want, (head to Three20South for a wide variety of live acts), a locals’ favourite (Angel’s Hollow is great for its sun drenched patio), or simply a range to offer (try Burke and Riley’s for a huge bar menu), you’ll have an amazing night out here. Blue River Bistro is a great place to eat out, with a hugely varied menu of seafood, meat and vegetarian options, as well as featuring gluten free dishes if any of your party has this dietary requirement. If you’re looking for something a little different to all take part in, check out Mountain Angler Fishing for guided fishing in groups.